mamiya 7 «Suad Bejtovic Photography etc. 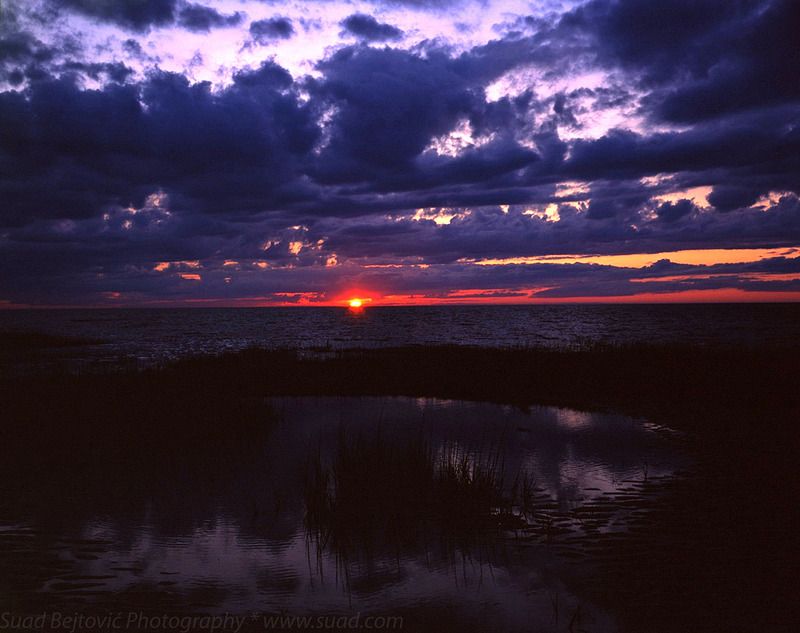 Suad Bejtovic Photography etc. 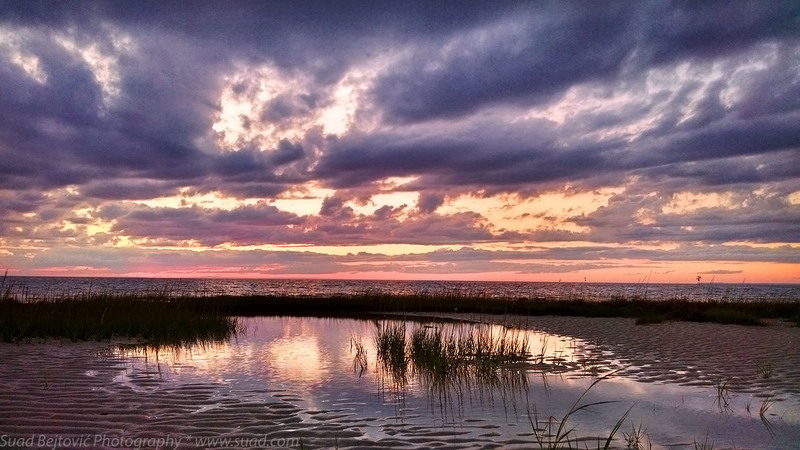 This past summer, I had the opportunity to visit Cape Cod, Massachusetts for the first time. It’s a place of quiet fishing villages, trendy tourist destinations and hip hangouts. Since it’s a peninsula, it’s also a very convenient destination for both sunrise and sunset photography – on multiple days, I was able to shoot both golden hours. In this post, I present three shots taken within moments of each other, with three different cameras. 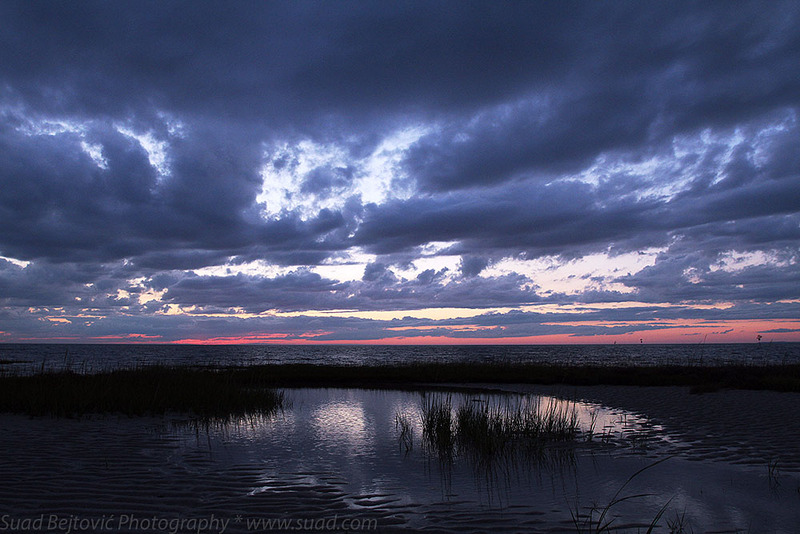 It was a sunset shoot at Rock Harbor, not far from the city of Orleans, MA. The extremely low tide left many tidal pools and exposed sand dunes and grass patches, so there were plenty of ways to experiment with composition. 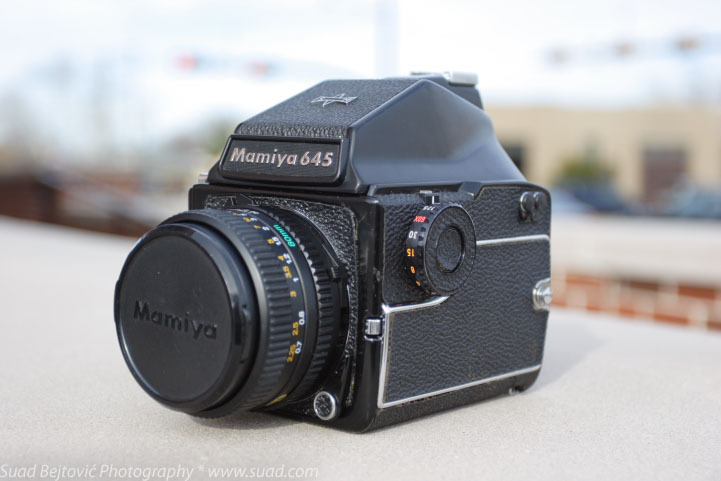 First up is my massively reliable medium format camera, Mamiya 7, which was loaded with the legendary Fuji Velvia 50 film. The metering for a sunset scene is never easy, and for a contrasty film like Velvia, I wanted to preserve the highlights, but the shot still ended up quite underexposed — most of the foreground is just too dark. On the other hand, the setting sun and the sky at the horizon have a great color to it, and I love the dark fluffy clouds on top set against the still bright sky. The composition of the foreground is also pleasing, with the patch of grass in the tidal pool. As usual for a shot done on Velvia, I didn’t do much post-processing; I tried to improve the shadows a bit, but not to the point where the photo becomes too grainy. A few moments later, the sun finally set, but the sky was still pretty bright. 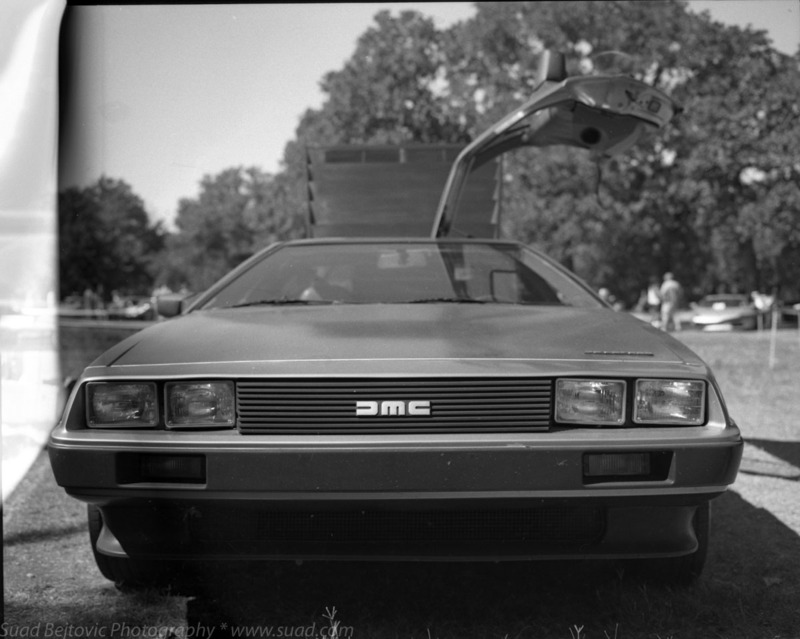 This shot was taken by my digital camera, Canon 7D, at the widest setting on my 17-40mm f/4L lens. The composition seems a little different, lower to the ground, and the horizon falls closer to the rule of thirds. The bluish tint is typical for the “blue hour”, but there is still some reddish hues to add interest to the shot. As in the film shot, the tidal pool provides a great reflection, and I like the ripples in the sand, too. I would have liked some more color in the photo, but it still has a nice moody quality – of the three shots, it would probably work the best in black and white. 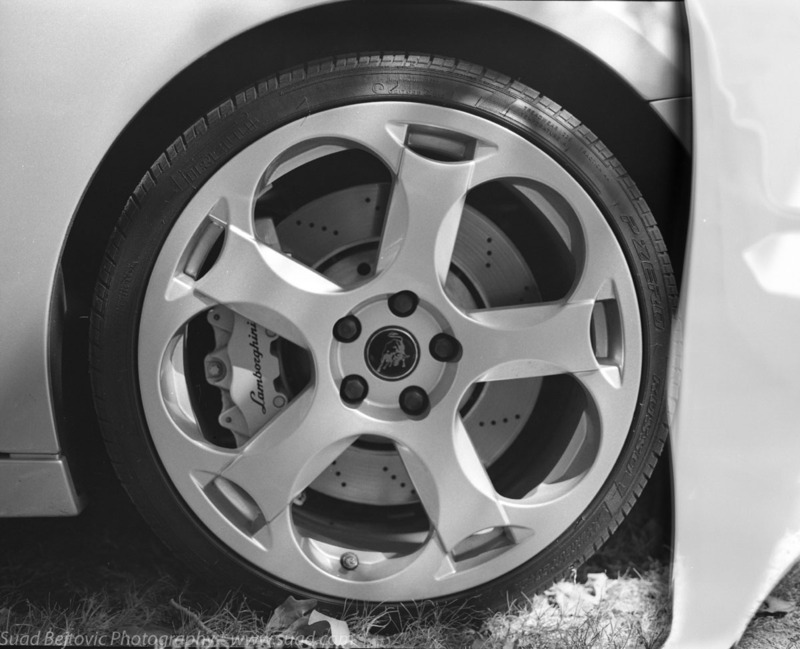 And speaking of quality, even at ISO 800, there is almost no noise or grain in the image. Finally, we have the humble smartphone camera; I had with me the Droid Ultra and its 10 megapixel camera, which is more than decent. 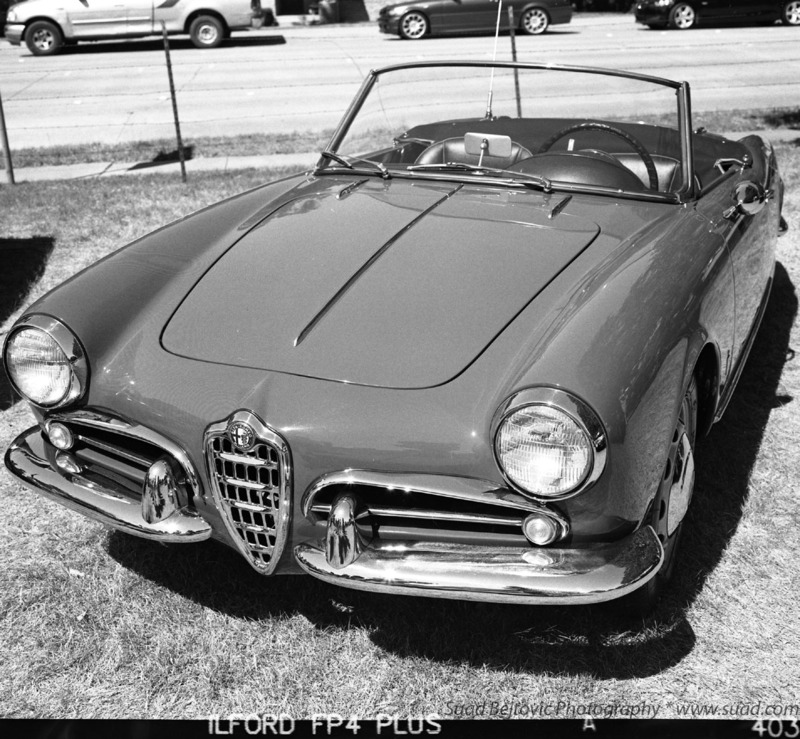 I metered for the brightest part of the image and let the automatic settings fall where they may. As it happens, I like this shot the best, and it’s partly because of the very wide native format of the camera, which works well with the scene. It’s also very bright, but nothing seems too blown out. There is some chrominance noise in the clouds, but other than that, the shot looks very sharp and clean. I posted it on my Instagram page in its cropped form. In the end, no one shot is significantly better than the others, but this exercise helps me compare how different cameras see the same scene, so that I can use them more efficiently next time. 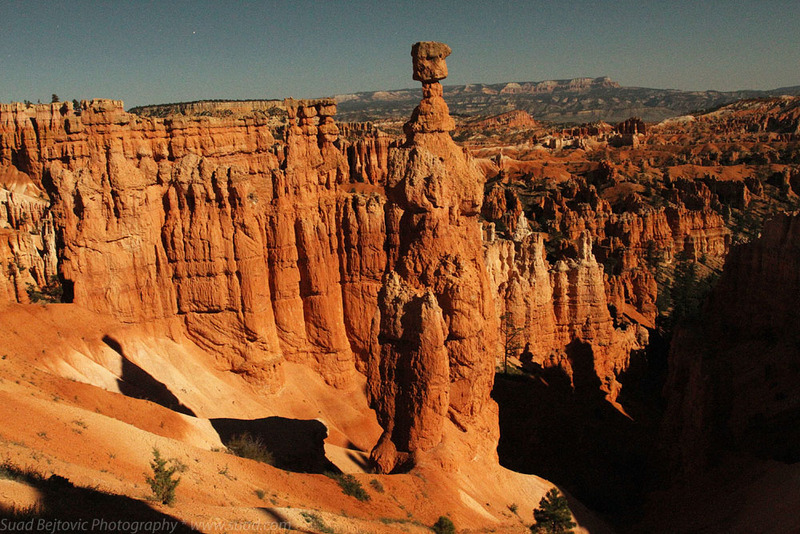 In my previous post from the Bryce Canyon National Park, I mentioned a rock formation known as Thor’s Hammer. 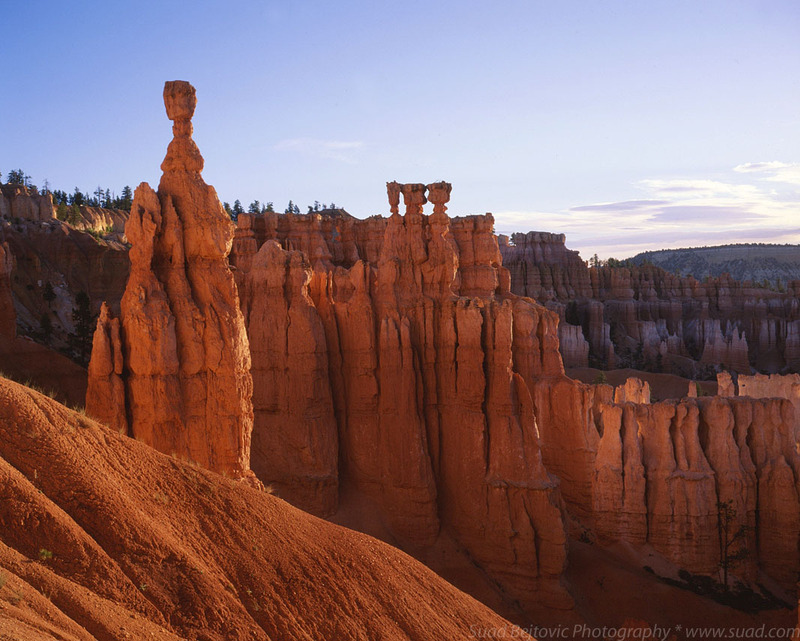 It is one of the countless “hoodoos” in the main amphitheater of the park, but possibly the most imposing and easily recognizable. It gets its name from the shape at the top of the spire; through some fortunate geological coincidence, the sedimentary rock at the top of the spire is harder than the one below it, so it eroded less over eons, resulting in the characteristic shape. 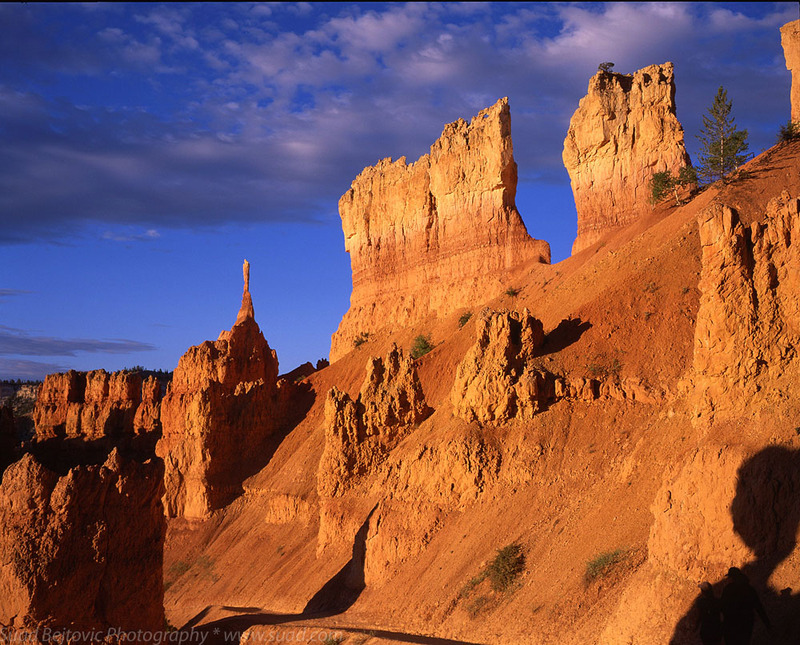 The rock is porous and the water that seeps in the microscopic cracks expands and contracts during endless daily freeze-thaw cycles, carving stone into hoodoos in the process. Geology meets mythology, you might say. To get this photo, I simply walked down the path just under the Sunset point. It’s about as close as you can get to the Hammer, as it sticks out from the slope of the canyon. The rising June sun paints it a bright orange color while most of the rest of the amphitheater is still lit indirectly. One thing I love about the amphitheater is the shades of orange and red that it creates as light bounces around in the tight spaces in between the hoodoos. It seems like Hammer has three siblings who live next door, but they are bunched together, and we’ll see over the next few millenia whether they turn into something quite as imposing as the Hammer. 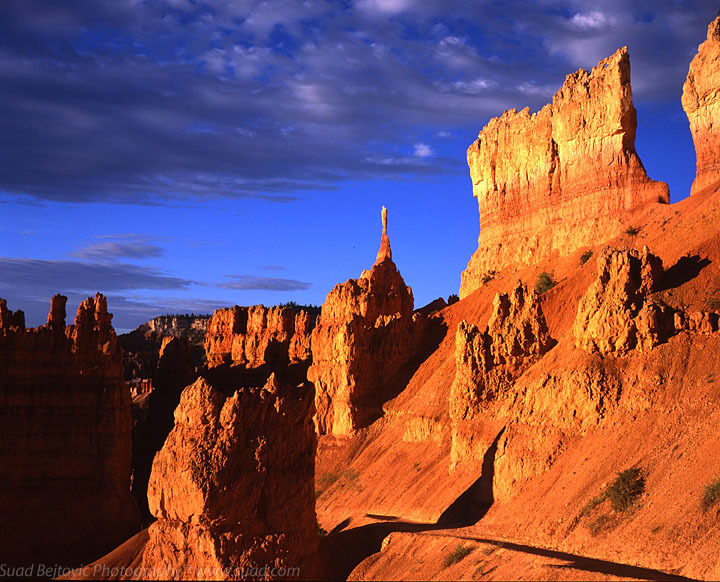 Who knows, maybe by that time the endless freeze-thaw cycles of Bryce Canyon would end Thor’s Hammer as we see it today. As it happens, I walked this path around midnight the previous night. The Moon was full and high up in the summer sky and it lit the amphitheater beautifully. 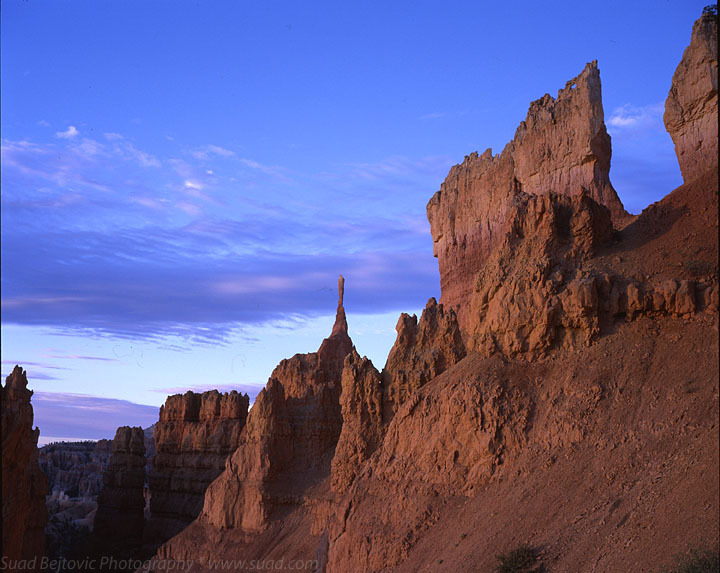 There were even guided midnight hiking tours, where visitors got to see a very different Bryce Canyon. I took several digital shots, and was reminded of an old technical problem; without a remote shutter release, I could only take 30-second exposures, unless I wanted to hold my finger on the shutter button for an extended period of time. On top of that, I had to use a pretty narrow f/11 aperture setting, to keep everything sharp, since camera has a hard time getting focus lock in such low light conditions. As a result, I bumped the ISO on my Canon 7D camera to 1600, but it all worked out nicely — photo is sharp and not too noisy, and offers a different perspective of this great looking rock. 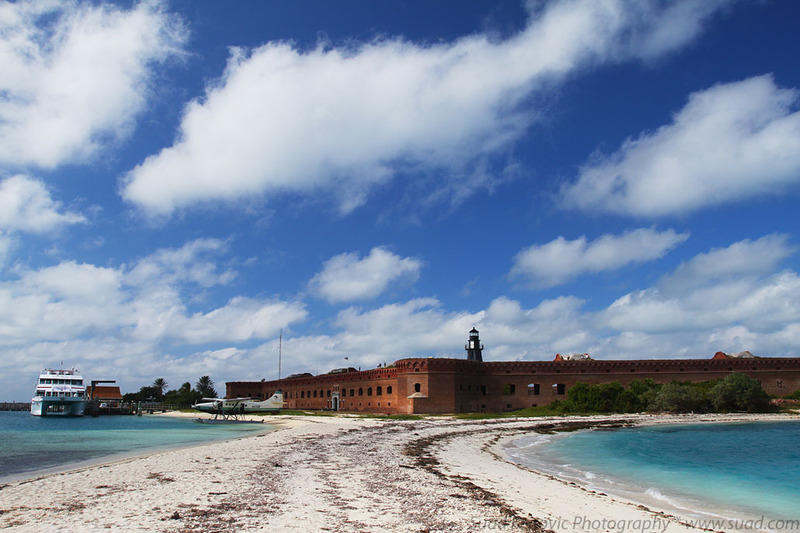 Although I’m a big fan of the National Park Service, I never even heard of the Dry Tortugas National Park until I visited Key West, Florida in December 2012. It’s an ecological paradise, sanctuary to countless species of birds and marine life. The only catch is that it’s located 90 miles to the west of Key West, which makes it one of the more difficult National Parks to get to. Nevertheless, a few photos on a brochure I looked at convinced me that the trip is well worth taking. My hotel made arrangements with the speedy boat to take me there early one morning. The ride is a couple of hours long and on this particular trip the sea was quite choppy, so some passengers lost their breakfast before they got to the destination. 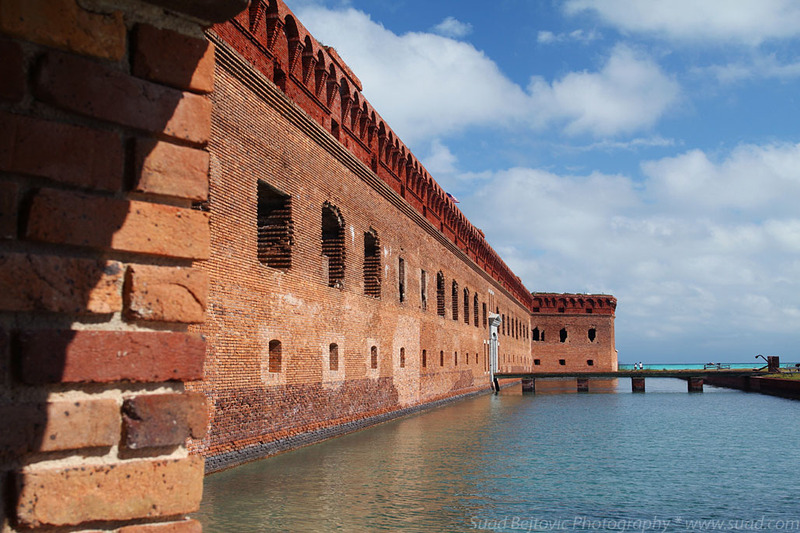 When we finally docked at Garden Key, we were greeted by the massive Fort Jefferson, built in the 19th century to provide a strategic stronghold in the Gulf of Mexico. Wikipedia says that it’s a largest masonry structure in the Americas, consisting of 16 million bricks. 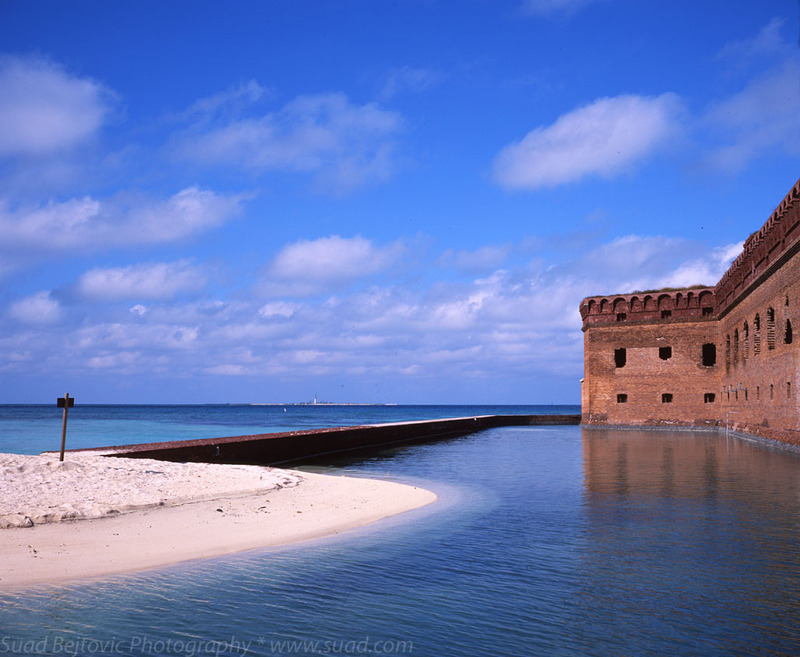 It even has a moat built around it, with a walkway that circumnavigates the fort. The fort was fully operational during the Civil War and it included a prison, whose most famous inmate was Dr. Samuel Mudd, serving the sentence for treating the broken leg of John Wilkes Booth following his assassination of President Lincoln. Mudd ended up serving as the fort doctor during the outbreak of the yellow fever in 1867, which in part led to his pardon. Civil War history of the fort is also evident by several heavy cannons that can still be found around it. 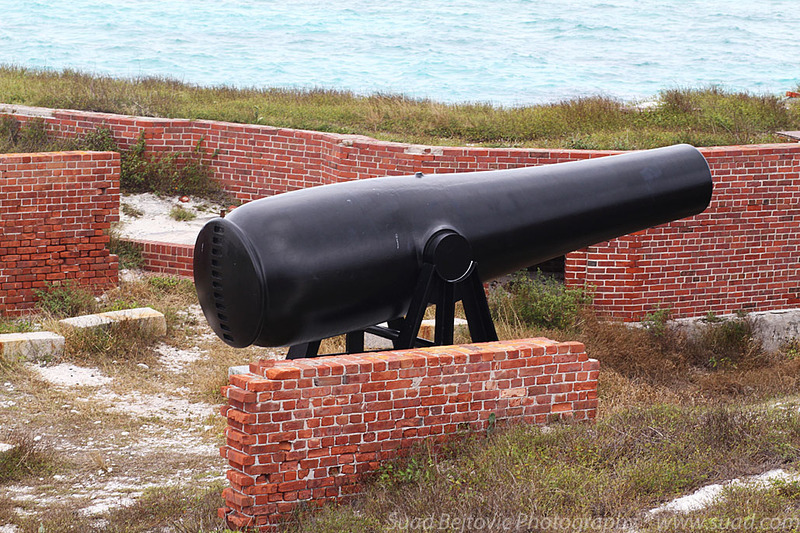 Pictured above is a 10-inch Rodman gun, one of the most common in the fort. Finally, since the tide was pretty low, I decided to walk across a small sandbar onto the Bush Key, which appears as a separate island on most photos I’ve seen, because the sandbar gets submerged. Looking back to Fort Jefferson, you can see on the left the catamaran ship that brought me there, and the seaplane which originated in Alaska judging from the tail insignia. Bush Key walk was thoroughly enjoyable and I made some nice photographs that I will share in a separate post. This post might as well be titled “St. Peter’s Basilica, Part Two, Part Two”, because the photos featured here are just about the same as the ones I posted a few days ago. 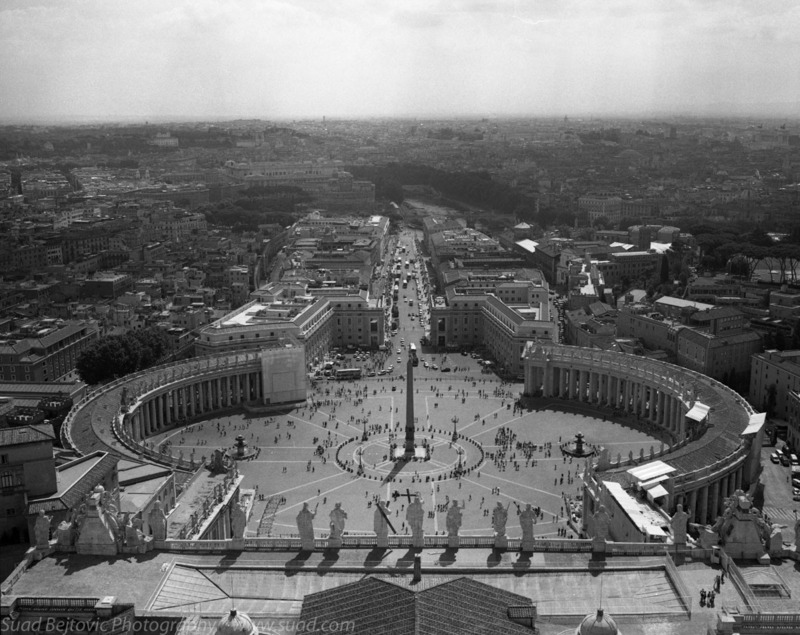 For the first photo, I climbed on a ledge of the obelisk in the center of the St. Peter’s Square, but I still had to crop off some tourists’ heads at the bottom of the frame, which made the photo a little wider than the natural 6×7 format of the Mamiya 7 camera. 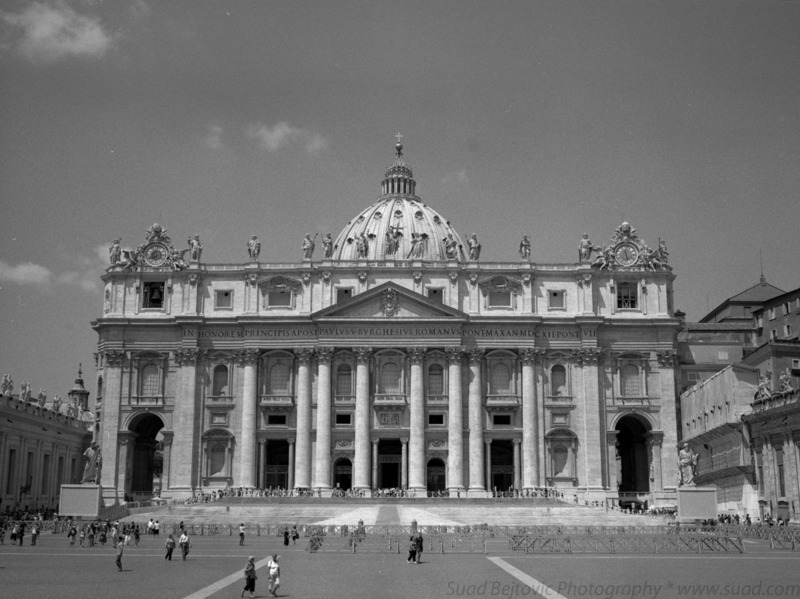 The photo from St. Peter’s cupola showcases that format very directly. The digital color shot in the previous post was taken with my zoom lens at 29mm, which is about normal for a small sensor digital camera. 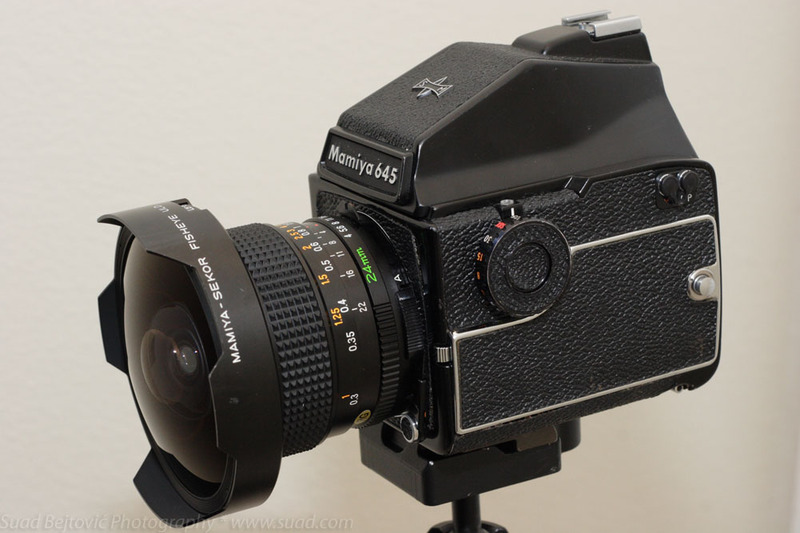 The lens I had on Mamiya 7 is also normal, 80mm, but because the format is more square, the field of view opens up to include a little bit of sky above the horizon, which was not visible in the earlier shot. I very much enjoy the 6×7 format, because it is very nearly square, so there’s no visible advantage to rotating the camera to a portrait orientation. That way I eliminate one of the variables and I have one fewer thing to think about while shooting. The day I went to the Coliseum with my lovely sister was a day that would break lesser travelers in two. Keep in mind, this is after we spent a day exploring squares and alleys of Rome, and wrapped it up by eating gelato at Trevi Fountain; and then another day of intense sight-seeing, which included a bus tour, more walking, and a late dinner. So, on this day, we walked half a mile or so to catch a bus to take us to Coliseum. 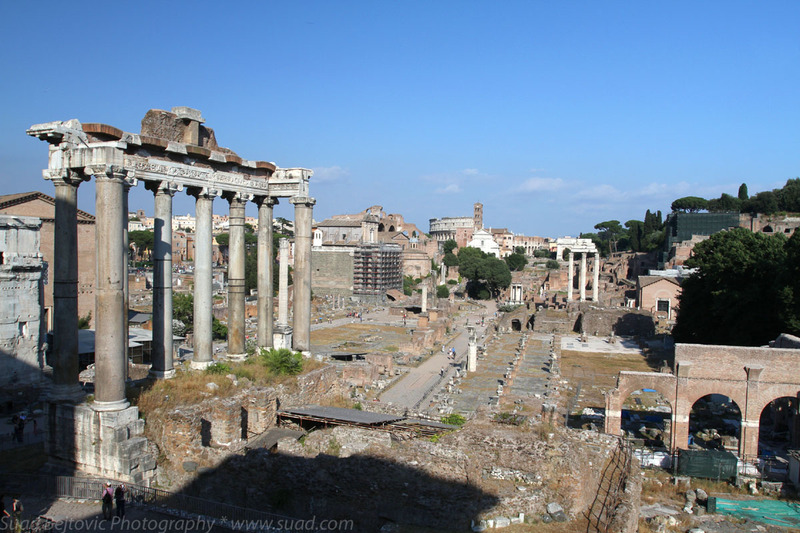 After spending several hours up and down the amphitheater, the next destination was going to be Palatine Hill, with all its archeological riches, including the Foro Romano, or Forum. I may have forgotten to mention that all these days were early July days, with temperatures pushing 100 degrees (or, for European purposes, close to 40). But, the thing about Rome is that it makes you forget how exhausted you are, because it comes at you from all sides with such awesome sites and sights that you forget about everything but how impressed you are with this city. To me, this was nowhere more evident than at the Forum. This whole area is essentially one large archeological dig that’s still very active. I’ve seen a hole in the ground that was dug up only a few years ago to reveal an elaborate system of rooms that seems to revolve around a central pillar, and a sign next to it which said that not even the scientists fully understand what they found. 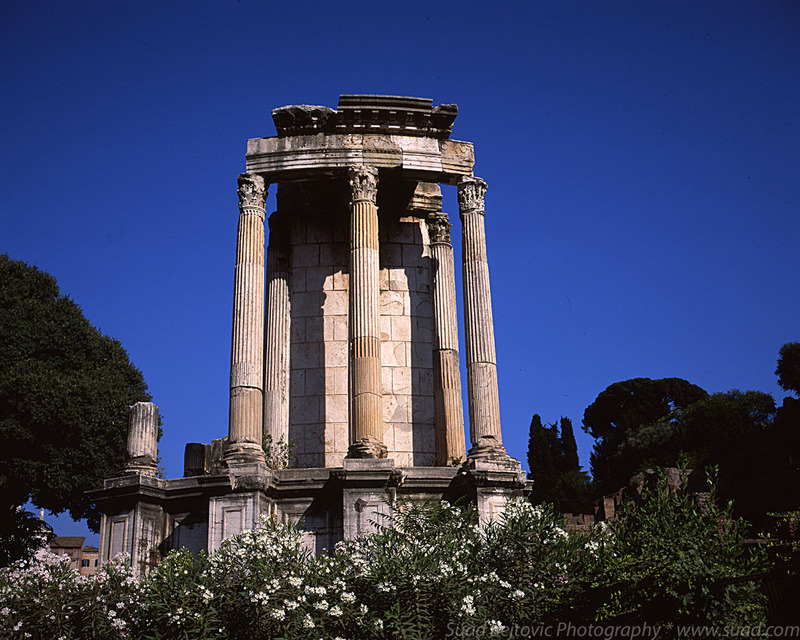 To have something like that discovered so recently, in the middle of Rome, a stone’s throw from Coliseum, is really remarkable. 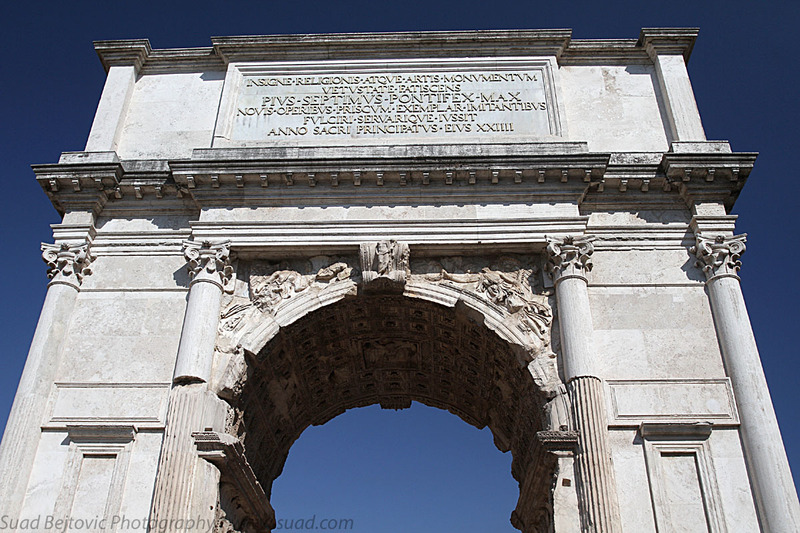 And so we pressed on, until very late in the afternoon, walking in footsteps of ancient Romans, through their marketplaces and temples, under their arches, by their columns, next to their walls. No kind of photograph can quite tell the story of how cool it is to be there, even on a 100-degree day. This place is my favorite city in the world. 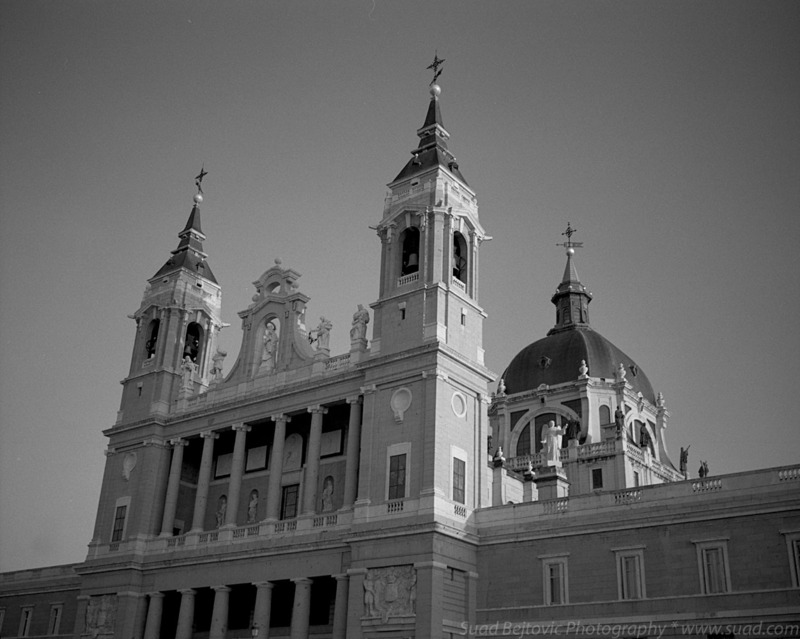 For my final photo from Madrid, I decided to re-scan this evening film shot of Catedral de Nuestra Señora de Almudena – a massively awesome looking church directly across from the Palacio Real. In fact, in the photo of the Palace that I posted the other day, I was standing on the steps of the cathedral. Pictured here is the north facade – you can see the setting sun hitting it from the right side of the photo. It’s worth noting that there is a statue of Pope John Paul II in front of the east entrance to the church. Which reminds me to let you know that next week I will start posting photos from my trip to Rome this past July, which included a visit to the final resting place of John Paul II.